Abbot Fyndon's Great Gate, with Lady Wootton's Green in the foreground, is a private entrance into the King’s School. The public entrance to the abbey ruins is on Longport. St Augustine's Abbey was a Benedictine abbey in Canterbury, Kent, England. It is named after Saint Augustine of Canterbury. It was founded during the early introduction of Christianity to the Anglo-Saxons. The original church was built at the end of the 6th century. It was ordered by King Æthelberht of Kent. Building started in 598. The ruins of St Augustine's Abbey, together with Canterbury Cathedral and St Martin's Church, were named a World Heritage Site by UNESCO in 1988. 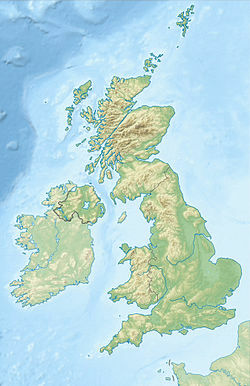 As a group, they are buildings which show the development of Christianity in Britain. ↑ "St Augustine's Abbey". English Heritage. Retrieved 6 June 2014. ↑ "Abbey of Saint Augustine". Catholic Encyclopedia. New York: Robert Appleton Company. 1913. ↑ "Houses of Benedictine monks: The abbey of St Augustine, Canterbury", A History of the County of Kent: Volume 2 (1926), pp. 126-133. British History Online. Retrieved 30 July 2010. Wikimedia Commons has media related to St Augustine's Abbey, Canterbury. Hasted, Edward (1801). "Abbots of St. Augustine's Abbey". British History Online. Institute of Historical Research. pp. 177–225. Retrieved 9 April 2013. This page was last changed on 25 February 2019, at 17:57.